This week's column is about a great little story by Heinrich Böll. To re-evaluate what really matters in life and to discuss the psychology or mindsets that got us to where we are today, there's no better explanation than the story of the Mexican Fisherman. An American investment banker was at the pier of a small coastal Mexican village when a small boat with just one fisherman docked. Inside the small boat were several large yellow-fin Tuna. The American complimented the Mexican on the quality of his fish and asked how long it took to catch them. The Mexican replied, "only a little while". The Mexican said, "with this I have more than enough to meet my family's needs". The American scoffed, "I am a Harvard MBA and could help you. You should spend more time fishing and with the proceeds, buy a bigger boat. "With the proceeds from the bigger boat, you could buy several boats, eventually you would have a fleet of fishing boats. Instead of selling your catch to a middleman you would sell directly to the processor, eventually opening your own cannery. "You would control the product, processing, and distribution. You would need to leave this small coastal fishing village and move to Mexico City, then LA and eventually New York City, where you will run your expanding enterprise." The Mexican fisherman asked, "How long will this all take?" To which the American replied, "15–20 years". "What then?" the Mexican asked. The American laughed and said, "That's the best part. When the time is right you would announce an IPO and sell your company stock to the public and make millions! You could retire to a small coastal fishing village where you could sleep late, fish a little, play with your kids, take siestas with your wife and stroll to the village each evening to sip wine and play guitar with your amigos." It's perfectly fine and usually safer to follow the beaten path; the experience is enjoyable. Just don't be afraid to take detours and explore outside the safe zone sometimes. 3 — Beware of the "deferred life plan"
This has always been the most poignant element of the story for me: Money is a renewable resource. Time is not. During our travels, we continue to meet people on both ends of the spectrum: Retired individuals who are just now beginning to explore the world and young people who have left the rat race and are out exploring and trying new things. Since the majority of us go through life waiting or saving up for retirement, what if you could instead have "mini-retirements", as Tim Ferriss, the bestselling author, puts it, enjoy your whole life, not just the last part? Re-evaluating your values is the most noteworthy takeaway from the Mexican fisherman story. We spend most of our lives working, but we seem to forget what we're working for. It seems like many of us prioritise money, work, and success over family and friends. Don't get me wrong, hard work is a necessary part of life, and the Mexican fisherman is evidently a hard worker. 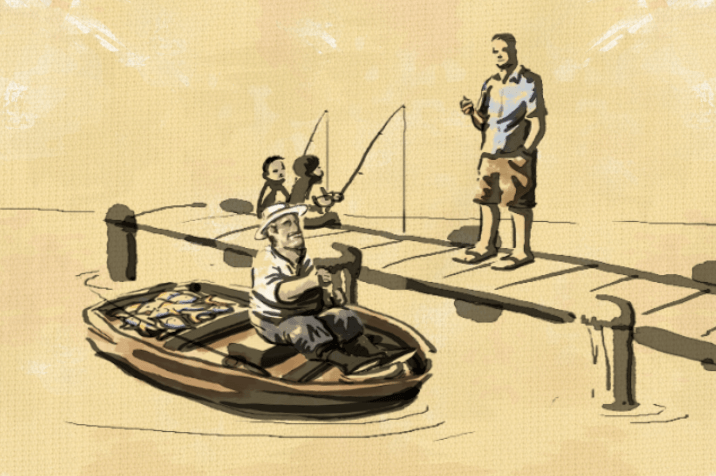 But rather than making work his life, the Mexican fisherman treasures his family and friends. Do you focus more on work or money than your family and friends? Take a step back and think about what you're actually working for. • Nick Stewart is the CEO and an Authorised Financial Adviser at Stewart Group, a Hawke's Bay-owned and operated independent financial planning and wealth management firm based in Hastings. Stewart Group provides free second-opinion service on your current investments, insurance covers and retirement planning. Older PostWhat is asset allocation for KiwiSaver funds?